Home Best of 25 years stamp set Happy New Year Stampin’ Up! Well – Happy New Year to all of my Stampin’ Friends!! July 1st is the beginning of the new year at Stampin’ Up! And of course with any new month there are new specials. 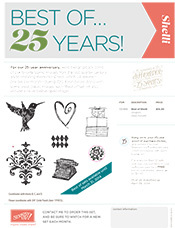 First of All: Designer paper – this is a great time to stock up on the new designs!! During the month of July purchase 3 packages of designer paper and get one designer paper for FREE! No limits. Order six? You’ll get two for free. Nine? You’ll get three for free. Check out the details here. The July Best of 25 Stamp set is the Best of Shelli. YOu can see the details here! Have a great day! !